Leadenhall Market is located in London on Gracechurch Street. Entry to the covered marketplace is normally gained through a series of thin corridors off of this thoroughfare. 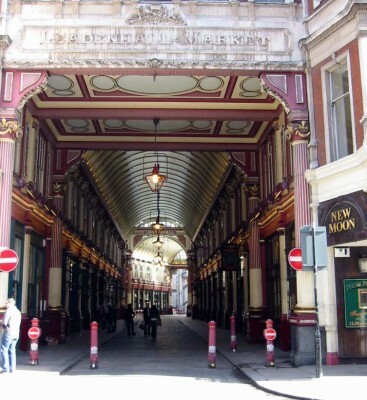 One may also visit Leadenhall Market by car or taxi using Lime Street to the east or south and Whittington Avenue to the north. Its location is part of the City of London’s historic center. The Leadenhall Market first came into existence during the 1300’s. Its location, which is now in a historic district, was the middle of Roman London which was founded in 43 AD. During that early period it was also a major commercial area for the Roman Empire until it was abandoned in the fifth century. In its early times the market was primarily the home to poultry, meat and game butcher shops. The structure itself is as appealing to tourists as the businesses that reside there. In 1881, architect Sir Horace Jones created an atmosphere accentuated by floors of cobble and an ornately appointed roof of green, maroon and cream. The entrance remains to this day as Sir Jones designed it. It is extremely high, but slender with triangular red bricks adorning the top of its side walls. The rest of the enclosures were made using stone blocks in a 17th century Dutch style. In 1991 a major restoration was completed enhancing the buildings historic qualities. Today, Leadenhall Market remains a great source for fresh food including the presence of butchers and cheese mongers. It has also become a popular venue for florists. Many more businesses call it home including clothes store and even a pen shop. The market is also a popular place to dine, with a wide array of restaurants, pubs, cafes and wine bars at your disposal. Chamberlains, Bedales Wine Bar and the Lamb Tavern are just a few of the many dining locations. Almost any cuisine you can think of is served here, from Italian and Mexican, to steak and pizza. There is also a specialty chocolate shop.